With 144 Opportunity Zones in 84 counties, Kentucky has a wealth of investment opportunities for your consideration. Hardin Scientific designs and manufactures SMART equipment and software that fast-tracks pharmaceutical discovery and development. Develop vacant land and run down structure into multifamily housing. Growth of existing OZ fund for higher liquidity to actively purchase adjoining plots of land for redevelopment. Redevelop existing property utilizing the Zoning codes R-2, R-3 & R-4 High Density Residential Multifamily. Restoring the interior and exterior, while maintaining the original 1800’s footprint and it’s character. Small to mid-size bourbon and moonshine distillery located on the banks of scenic Lake Carnico. Site also includes a golf course and multiple building sites for distilled, museum, restaurant, and hotel. Renovate and construct Duplex out of single family structure. One street north of Main St Downtown Lexington. Total investment 100,000. Current Monthly Market Rent, $2,000. It is an indoor Family Fun Center, for the entertaiment of the whole family, With Party rooms, Restaurant (optional), a three - level Playground with multiple games, Minicars, Go-Karts, for children, youth and adult. (Perfect ubication in a opportunity zone). Rock, sand and clay quarry being developed. Stone tested by KYDOT Materials Testing Division - polish resistant aggregate. Clay has high alumina content. Development of Camping and cabin rentals plus retail outlets for restaurant and retail gift shops. The purpose of this project is to construct rental cabins, zip line and a fishing camp. In order to give guided tours for the Daniel Boone national forest. This site has 166 acres located behind the Logan Memorial Hospital that is prime for residential development. Previously a Houchens Sav-A-Lot grocery store building 14,000 square feet on a 20 acre site on the east edge of Russellville. Suitable for redevelopment commercial, retail or housing. A museum dedicated to the history of Native Americans from the region and beyond. Also a cultural center to host powwows and classes on Native American crafts, music, and dance. Investors who have created a Qualified Opportunity Fund (QOF) are invited to list their funds so they may be displayed on this site. If you would like to list your fund, cick below to provide details. Note: Listing your fund is not required. However, it may lead to enhanced investment opportunities. 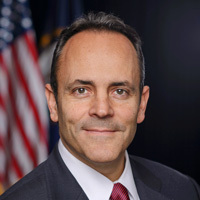 President Trump will address attendees at the White House Conference on Opportunity Zones TODAY at 1:00 p.m. Then at 2:00 p.m. Kentucky’s Jessica Burke will discuss the Commonwealth’s Opportunity Zone advantages during a panel discussion. The highlighted counties on the map include one or more opportunity zones. To see if a particular address is located within an Opportunity Zone, type in the address in the box on the upper right corner area of the map. To zoom into street level in a particular county, click repeatedly on that county until you reach the area you wish to view. You can also use the links at the top of this intro to switch maps. Kentucky has a variety of industrial sites and buildings in Opportunity Zones that are available immediately. Click on the map to learn more detail. Opportunity Zone workshops are being held throughout Kentucky to better prepare communities and businesses for investment opportunities. This presentation, in Lexington, took place on March 19. Other workshops are being planned. Kentucky will maximize this golden chance to attract economic development projects to communities most in need across the commonwealth, and the Kentucky Opportunity Zone Initiative will strengthen and rebuild both rural and urban areas.